Being pregnant can be hard. Job searching can be, too. Combining the two makes for a uniquely challenging task. A pregnant job hunter may wonder if she should share the news with interviewers—and when. Simple tasks like finding an appropriate interview outfit can require hours instead of minutes, and meeting times may need to be coordinated around pregnancy symptoms. Still, while it may require adjustments, being pregnant should not stand in the way of a job search. If you’re expecting, and either want or need a new job, here’s what you need to know about successfully job searching while you’re pregnant. Can companies choose to avoid hiring pregnant women? Put simply: No. They aren’t supposed to. Legally, the Pregnancy Discrimination Act (PDA) prohibits employers from discriminating based on pregnancy, childbirth, or related medical conditions. But what’s legally correct, and what occurs in practice, do not always match up. For instance, chances are you've been asked at least one of these illegal questions during an interview. So, it’s hard not to suspect that some employers would—without saying a word—opt to avoid hiring a pregnant candidate because of conscious or unconscious bias. That can be especially true when your pregnancy is noticeable. One right you don’t have as a newly hired person: coverage under the Family and Medical Leave Act (FMLA). Among other things, this act guarantees eligible employees the right to retain their position after going on maternity leave. The key word there is eligible: to be covered under FMLA, the company must be of a certain size and the employee must have worked there for at least 12 months. If you're pregnant while interviewing, you are not covered under the FMLA. However, many companies have generous family-leave policies that go beyond the legal requirements. If you’re pregnant (even if you get health insurance through a spouse) it’s particularly important to ask questions about the benefits package, including the company's maternity leave policy, short-term disability coverage, health insurance options, etc. This way, you’ll be informed about what coverage you can expect while you’re pregnant and beyond. Should you tell potential employers you’re expecting? The answer to this question is... it depends. While there's no legal requirement for you to tell employers you're pregnant, other factors may convince you to share regardless. As well as whether or not you should share, consider when to share the news. You don’t want to explain yourself out of a job offer if the employer would hesitate about making one once they know you’re pregnant. How far along are you? If you’re interviewing in your third trimester, it makes sense to mention your pregnancy proactively, before (or during) any in-person interviews, since hiding your bump won’t be possible. In earlier trimesters, however, you can dress to obscure your pregnancy. And, if you’re very early on, you may not even be sharing the news with close friends and family, so you certainly wouldn’t want to tell an interviewer you'd just met. Will not sharing cause a trust issue with your future employer? A company that won’t hire you while you’re pregnant may not be a family-friendly place to work. Keep that in mind. If, however, the job isn’t doable while pregnant (for instance, if travel by plane is a weekly requirement), it’s best to mention your pregnancy during the interview. That way you can see whether the company can make accommodations. Otherwise, when you share the news after accepting the job, your manager may feel betrayed and you could wind up with a strained relationship. Perhaps you have morning sickness that strikes daily at 11 a.m. Or you're hit with a wave of fatigue every afternoon. Maybe you need to pee more frequently than ever before. All of these things—as well as the changing shape of your body—are something to keep in mind while scheduling and preparing for interviews. Make sure your interview outfit still fits properly (and get a new one if necessary). Also, try to schedule interviews for the time of day when you feel most alert and unaffected by pregnancy symptoms. Discuss your plans for maternity leave and transitioning back to work and how you will prepare coworkers for your leave. Keep the employer's perspective in mind—they're likely to be concerned about two things. First, that your leave will be disruptive at work. Second, that you will not return to work after your maternity leave. You can offer reassurances about both these concerns. But don’t let your pregnancy dominate the conversation! Be professional and keep the interview focused on your skills, experience, and how you’ll be an asset to the company. If your plan is to be with the company for years and years, your leave time will be just a blip compared to your total tenure at the company, and the value of your contributions. If you do not disclose your pregnancy during an interview, it’s a good idea to share the news after the company makes an offer. (Note: If you are early in your pregnancy, feel free to hold off.) Having a job offer opens the door to negotiations—now is the time to ask for leave and any other accommodations. And remember, the company made you an offer because they’re eager for you to come on board. Telling your employer at this point also allows them to plan ahead so that any leave time you take is not disruptive to operations. Do you have more questions? 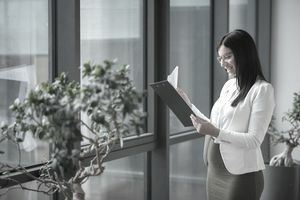 Here’s information on pregnancy and employment for both job seekers and employees, including the scoop on family leave, disability, and discrimination issues.